Just off the highway in Bedfordview, Johannesburg, by the retirement village, the faint clanks of hard plastics meeting can be heard. Through ornate gates covered in garish gold lettering jumbled together to make Italian greetings, past the old Alfa Romeos that have taken heavy beatings, and just off to the right of the convention hall, there sits long stretches of tar covered with the faintest sliver of sand. These are the bocce courts of the Italian Club of Johannesburg, a sacred ground for congregation and celebration. Across each lane are Italian men who are entranced by a sport that is a nostalgia wave for those skimming the twilight years. 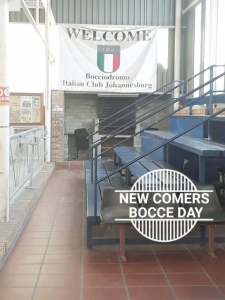 The men are the embodiment of the Italian community that still has a foothold in South Africa. They were among the early settlers to find some means of travel to come across the world for a better life. Looking for a change, they came here and have since had their families spread across the land. 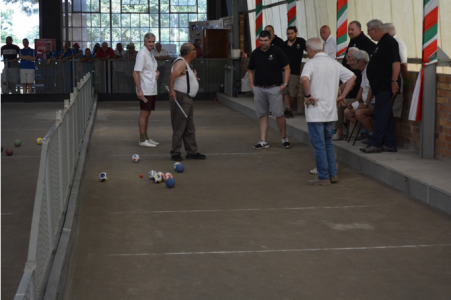 Bocce for these men is the purest means of remembrance for the “old country,” only augmented by a room filled with the stale smell of cigarettes and spilt wine mixed with the sounds of Renato Carosone’s Greatest hits. From the black tribes that shifted across the vast African landscape to the Europeans who journeyed across the sea, there are many people who stem from disparate lands, but being South African allowed them to forego being strangers. They share the philosophy of Ubuntu (or “communitiness”), an attitude distinctly South African in spirit yet adapted by almost anyone who has embraced their cultures.Within South Africa, heritage is placed at the very core of identity. Maintaining culture and one’s roots are considered duties as members of the “Rainbow Nation.” The notion that cultural identities were not to be divided or eliminated, but to be celebrated within the new democracy was preached by Nelson Mandela and the African National Congress. Through their families that now teeter on a fourth generation, the Italian identity persists. The only difference is the lack of an accent. To be Italian is a celebration of its own. This is shared along with all the cultures of South Africa, regardless of ethnicity or creed. What the bocce players symbolize is the inherent freedom to be who you are even in a distant land. They are immigrants who have been able to maintain their culture through the generations. As an Italian on my mother’s side, I cannot help but celebrate these men through all their blemishes as something of a family. They may not be related, but their drive and connections brought me to where I am today. They are distinctly immigrants; Italian in blood, nature and tone. They are still South African, a country where you don’t have to distance yourself from your past, though you need to be prepared to share it while embracing another’s cultural history. It is the purest display of the spirit of Ubuntu from a gathering of Neapolitan geriatrics who would never know the term. I enter the courts alongside my uncle. I’m finally able to meet the men I know only through passing mentions. I don’t know them personally, but it doesn’t quite matter because they know me, or at least they know my grandfather. He was a renowned crook who hustled almost any new player right off the boat. He would pull out his black bocce set and be prepared to make some salty husbands return to even angrier wives. They remember my grandfather, nearing two decades since his death, and just by hearing my name, they make the connection. 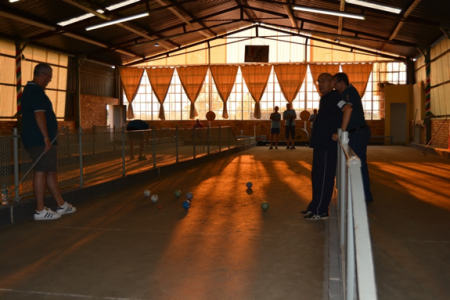 Unable to communicate fluidly with their broken English didn’t much matter to the bocce players. All they know about me is my grandfather and yet they welcome me to the courts as one of their own. Bad blood from his hustles had dried up and these men open the doors to their society. That is the strength of the community, demonstrated through the openness of cantankerous old men who only ever finished a third of their matches.